There were so many restaurants had been opened in Tokyo in the past one year, and quite a few restaurants soon get great reputation such as Tempura Takiya in Azabu-juban. It is currently seating at No.1 among all the tempura restaurants in Tokyo according to Tabelog. This 15-seat tempura restaurant was opened in August 2015 by Chef Tatsuaki Kasamoto (笠本辰明), who was trained at tempura Hinokizaka at Ritz-Carlton Tokyo. I was attracted by Chef Kasamoto's unique understanding in tempura cooking which we will see later. Accompanied by incredibly high considerations by both locals and visitors, my friend 'luckily' got the last reservation in 2016 . The 'fatty' meal started at 9pm and we walked out at 11:30pm. It was totally worth of value and calories. Takiya located in a residential neighbourhood off the main street of Azabu-juban, it is quite hidden even with the help of GoogleMap because there's no signboard no matter outside the building or in front of the restaurant until we stepped in. Unlike most tempura restaurants i have been in Japan, which looks comparably old fashion and dim, the interior of Takiya was obviously well-designed, bright, clean. The green asparagus as a decoration wisely reflects the season and symblize 'evergreen'. I also noticed that the restaurant has no smoky or oily scent at all although it was the second seating. The first impression of a restaurant is always important, chef wears a warmest smile on his face ALL the time which was a very good sign. 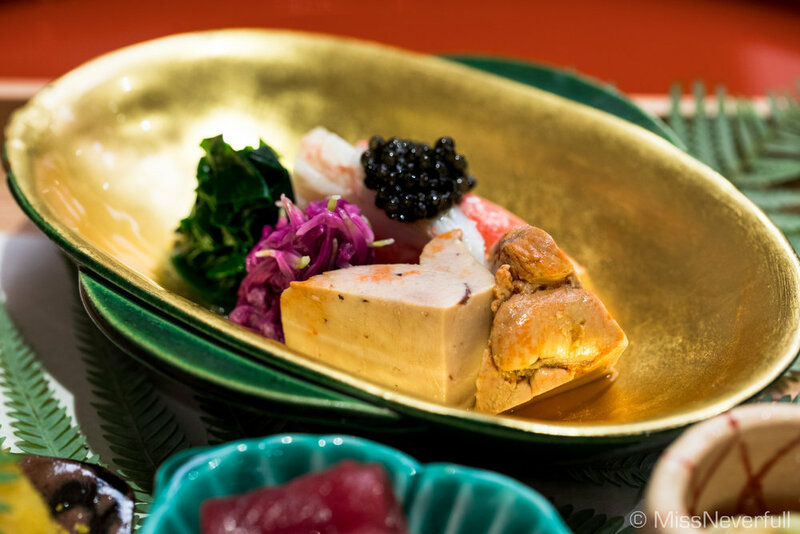 We started with an appetizer platter, including hotate-gai with karasumi (scallops and dried mullet roe) , Ankimo with matsuba-gani (snow crab) and caviar, yuba (tofu skin) from Kyoto, Akami-zuke (marinated tuna) with tororo (grated yam) and raw quail egg yolk. This nourishing appetizer plate is rarely served at any other tempura restaurants, it nicely gives a delicious touch of the seasonal produce, at the same time, showcasing Takiya's anti-traditional philosophy. Three kinds of salt were also served with tempura: matcha, curry and plum infused salt. It is another interesting concept, especially the curry powder. Cannot wait to see how they work with tempura. The first few pieces of tempura were outstanding. Starting from the incredibly crispy prawn heads that was fragrant and umami, to a perfectly cooked prawn body which has a very thin battering and succulent center. It was a high season to eat gingko nuts, Takiya's ginko nuts was argubaly the best gingko nut tempura i have ever had, wonderfully-cooked to keep the chewy texture and green color inside, with a mouthful of mildly sweet taste. Another highlight was the Aori-ika, possibly the best i have had so far. I thought it was Kisu when the little white fish arrived, but it was actually Haze. It was also pretty, crispy outerlayers and tender flesh in the center. I was in love when the Matsuba crab tempura was served, inside the yuba (tofu skin) was incredibly juicy and umami crab meat mixed with crab miso. Never had a creative tempura like this, it was as amazing as it sounds and looks. Besides the fish and seafood, the vegetable tempura were also well-done: lotus root, asparagus and the gingko nuts which had been mentioned earlier. Shirako, one of the best treat by the winter season. This is probably the most fancy version of shirako tempura i have ever had, it was served with a creamy dashi sauce and topped with Alba white truffle. The shirako itself was so creamy that makes my heart melting, with truffle slices to lift the flavors. However the sauce was a bit too salty to match the shirako. The more funny thing was, chef 'kindly' gave us a small spoon which seems we suppose to finish the sauce, but i am so sorry about that. Interestingly, the meal continuted with a bowl of nourishing vegetables with an onsen egg and duck breast ham. On the bottom you may find quite a lot sliced radish and a layer of green leaves underneath assorted mushrooms. The onsen egg was perfectly poached, its creamy yolk and duck breast nicely seasoned the entire bowl of salad. This gives a well balance to the entire meal, although i love vegetables, i somehow believe this dish is not really needed throughout the entire meal. This was no doubt the most famous tempura at Takiya. Chose the leaner cut from the tenderloin filet of Kagoshima beef to be deep-fried rolled with a shisho leaf, the texture and flavors were indeed outstanding. The beef itself was moderate in fat and balance very well with the shisho leaf. I never thought of this combination before but it was really remarkable. This reminds me of the Cantonese baked crab shell stuffed with crab meat of the entire crab, yes, this is Takiya's tempura version. I showed Chef Kasamoto a photo of a similar crab dish i had at Matsukawa few days ago, he laughed and said 'Matsukawa's tempura version'. This is a really creative way to serve crab tempura, inside the layer of deep-fried crab battering was large portion of cooked crab meat, crab miso and crab roes. I really loved this concept and tastes despite the slightly over-salted gravy sauces on the top. Similar to the previous shirako dish, Takiya's gravy sauces didn't really work for me. We weren't not asked to choose between ten-cha or ten-don because there's no second option, the only rice served at Takiya was tendon, served alongside with miso soup and pickles. The chef kindly asked us for the portion of rice, we both picked the smallest portion but we soon realized rice was too less to match the asparagus and anago tempura. This time, the tempura was deep-fried for a longer time and flavored with sweet soy sauce, great taste but make sure you get regular rice portion. The food was definitely worth mentioning, i enjoyed everything except the heavy sauces (in the last crab and shirako) which was quite salty for our liking. Put aside the sauces, and possibly the salad, the main part was really marvellous. Another remarkable thing was the incredibly amazing service, chef Kasamoto wears a warmest smile throughout the meal, ALL the time, and i can feel the smile is deep from his heart. He served all the dishes to us by himself and detailedly explained to us, patiently answered our questions and shared his philosophy with us at the end of the meal. An interesting story to share several day later, i went to Sushi Saito for dinner and met someone looks quite familiar smiling and waving to me. My first thought was 'this guy was so drunk'. He kinda read my face and said ' I am the chef from Takiya' with a smiling face...what a coincidence!